Oba Rilwan Babatunde Osuolale Aremu Akiolu is the paramount ruler of Lagos and the chairman Lagos State council of Obas. The Council of Obas and Chiefs is one body, which has the capacity to contribute phenomenonally to good governance in the State by constantly availing government of its wisdom and sound advice: using its tremendous influence to mobilize popular support for public policy as well as being an important source of communication and feedback between the government and the grassroots. As an institution, the Council of Obas and Chiefs is as old as Lagos State itself. It was established following the creation of Lagos State through the Council of Obas and Chiefs of Lagos State, Edict 1969 which came into force in April, 1969. The erstwhile Council of Obas and Chiefs, which was constituted in December 1995 with Thirty-One members, was dissolved in 2007. The 73 year old Oba who has been on the throne since May 2003, has been able to work with prominent Lagos Obas to bring about the new face of Lagos under the Gov. Ambode administration. The new Council has a total of 51 members drawn from the 5 divisions of the State. The Oba of Lagos is the permanent Chairman of the State Council of Obas and Chiefs with 4 Vice-Chairmen drawn from the remaining 4 divisions of the State namely Epe, Badagry, Ikorodu and Ikeja. One of the qualities of Oba Rilwan Akiolu is that he has been able to work not only with his 4 Vice Chairmen but has been able to work with other 45 Lagos Obas who constitute the Lagos council of Obas. They are the Ayangburen of Ikorodu, Oba Adewale Shotobi, Alara of Ilara in Epe, Akran of Badagry, and Olu of Ikeja. Oba Saheed Elegushi (Kusenla III) may be very young but permit us to tell you that he is one of the Lagos State first class Obas. Oba Gushi has he is fondly called oversees the affairs of Elegushi part of Victoria Island and relay information to paramount ruler of Lagos when necessary. Have you ever sighted this two Obas who are close to Oba Rilwan Akiolu. This is the story of Oba Tijani Adetunji Akinloye and Oba Abiodun Idowu Oniru. They are both first class Obas in Lagos. Oba Tijani Akinloye is the Oba of Ojomu Ajiran in Victoria Island. They are inseparable friends and most of the time step out at events together. Many revealed that it was because they became Oba almost the same time that made them so close. Oba Ajiran has been on the throne for 22-years while his friend Oba Idowu Oniru has spent over 21years on the throne. The stool of Alaiyeluwa Oba Akanni Ayeni the Onisiwo Of Tomaro and Abagboland in the Eti-Osa Local Government Area. has been vacant since he joined his ancestors few months ago. He was made the Oba of Eti-Osa by former Governor of Lagos State, Bola Ahmed Tinubu and has spent over 13 years on the throne though many will not forget the cordial relationship that existed between Oba Akinolu and Oba Akani Ayeni until he died few months ago. He was a traditional chief for many years until he was elevated to a first class Oba in Lagos State. Formost Lagos Fashion Designer, Alhaji Lateef Adams ( Latris) a few months ago assumed the throne of his forefathers when he became Oba of Ikate in Surulere. The whole of Otto Kingdom which is under Surulere, Ijesha and its environs is under the able leadership of Oba Ganiyu Okeyide Odesanya, Oloto of Otto in Mainland, Lagos while Oba Patrick Ibikunle Fafunwa is the custodian of lands in Ikoyi. 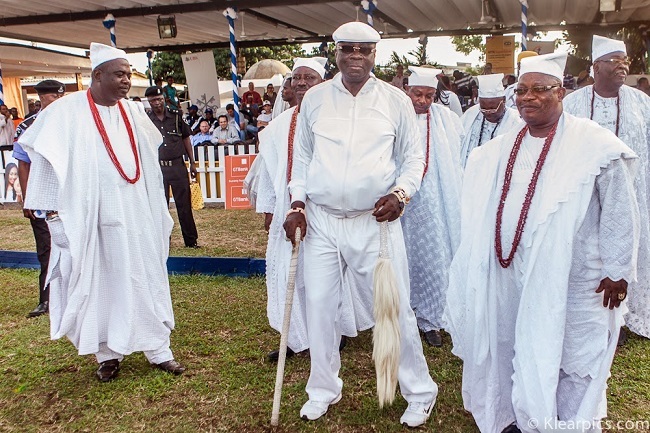 In Lagos, there are some Lagos Chiefs who also work directly with Oba Akiolu. Their tittles are bigger than Lagos white caps chiefs and some have also been elevated to the post of Obas while waiting for staff of office. They are called traditional chiefs and they control certain communities in Lagos. They also have their Palace and have white cap chiefs who run the affairs of their territories with them. One of them is Chief T Jinadu-Eko, he is the Olorogun-Adodo of Lagos State. Others are Chief Fatai Olumegbon (Olumegbon of Lagos) and Chief Tajudeen Gbadesere Eletu (Eletu-Odibo of Lagos) . Oba H.O.A Kassim-Bashua (Odu I) (Oba of Somolu) ,Oba Wahab Ayinde Balogun (Olofin IV) (Oba of Isheri-Olofin) ,Oba Bashiru Oloruntoyin Saliu (Oba of Oworonsoki) , and Oba Abdul Fatai Adisa Irawo-Ogunsi (JP) (Oba of Odi-Olowo). Oba Michael Gbadebo Onakoya (The Orijeru of Ifgbooye Land) , Olu of Epe, Oba Sefiu Olatunji Adewale(Olu of Epe) . Oba N. A. Akinyemi (Alabirun of Ikaare) ,Oba Mobadenle O. Oyekan (Onilado of Ilado and Inagbe Island). Chief K. H. A Oshisanya (Ara of Ikorodu) , and Chief Williams Adebisi Adejo (Olisa of Imota).